When is a .Torpedo not .a Torpedo? .I don't remember who first told .me that the Montecristo No.2 .was a Torpedo. But it was in .the mid-60's and obviously.said with some authority, and who was I, the young man.from Durban, to doubt him? So that was it - a Montecristo No.2, one of the most highly acclaimed cigars in the world, was a Torpedo. Over the years, comments and requests from customers and other sources reinforced the belief that a flared cigar was basically a torpedo irrespective of the ring size or length. In "The Havana Cigar" published in 1971 for Hunters & Frankau, Iain Crawford refers to a Montecristo cigar - "the popular Number 2 cigar which is 6 inches long and torpedo shaped". Then came the "Cigar Boom" of the 1990's (it really has a lot to answer for) and with the proliferation of brands, shapes and sizes, confusion reigned. The public wanted information - and especially clarification of the cigar jargon that was developing. Books were published, articles appeared in magazines on every aspect of the cigar and its mystical appeal, "experts" abounded. All would be made clear and simple for anybody to enter the world of cigars, and talk with authority and confidence on them. Peace and tranquillity would prevail - people would know exactly which cigar they wanted, how to ask for it, and how and when to smoke it. You were free to smoke with the band on or off; the flat cut was in, the cigar drill was out; selecting the correct cigar for the occasion was clever; storing your cigars required attention to temperature as well as humidity; "robusto" became the generic for the short thick cigars (approximately 50 x 124mm, previously described as "rothschild" or "epicure"); and the commonly accepted name of the shape of the Montecristo No.2 came under suspicion. "Torpedo - A cigar in which the body flares (widens) and then narrows near the tuck where it is to be lit." "Pyramid - A cigar that gradually goes from a very narrow ring size at the head, and flares out to a large foot. Almost always incorrectly referred to as a "torpedo", which it is not." So there we have it - from a respected modern authority. The Montecristo No.2 is a Pyramid, and not a Torpedo. In fact from these definitions, I can't think of any Cuban Torpedoes available in South Africa. But we have some great Pyramids! The naming might have changed, but the shape and smoking quality hasn't. It has always been understood that the cigar is technically difficult to roll. The basic difficulty comes in tapering the 52 ring size foot down to a pointed head without interfering with the free flowing draw. Only the most highly skilled rollers can achieve this - hence the scarcity of the cigar and its high price. When well made, it gives a superb smoke - probably the best in the business. I wish you all the best over this season - and peace and prosperity in 2003.
. - A collection.of refurbished pipes to delight the eye, taste and pocket.
. We are pleased to offer our first website collection of refurbished pipes. When new, many of these would have been in the Prestige Pipe class. Now that they have done service for one proud owner, they have been restored and are ready to give pleasure to their next owner at a fraction of their current new price - well worth looking at! The collection includes Dunhill, Charatan and Savinelli pipes - and a very large Jumbo. Prices range from R250.00 to R850.00 - for pipes valued new to-day at up to R2000.00 and more. The quality of the refurbishment is amazing. 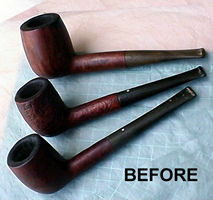 Click here to see the collection and full article - including tips on how to refurbish your own pipe at home. This time last year I mentioned this little thug, and what to do to avoid a visitation. But how do you know if he has paid you a call - and what damage does he cause? The beetle (Lacioderma or Lasioderma serricorne) starts out as a harmless egg, laid deep in the tobacco leaf. Under suitable conditions (excess warmth and humidity) the egg hatches and the resultant worm eats its way out of the cigar, leaving a small round hole and a trail of fine tobacco dust. It usually seems to stick to one cigar, but occasionally it travels along other cigars, eating as it goes, and creating a trough on the surface. At some stage the worms metamorphose into tiny brown beetles which are often found in the bottom of the boxes and may even fly to other boxes continuing the damage. In Durban in the 60's, before the days of air conditioning, this was a real threat in shop humidors. My Dad used to import "Burma Cheroots", but as he said "The shipping out of Rangoon was so slow, the weevils (beetles) got more than we did". We visited a top cigar importer in the UK about 20 years ago. One of his agency lines was the same range of Burma Cheroots. When they arrived they were sorted in a safe place into "beetled" or "clean". The latter were stored in what had been the butter room - the coldest room in the basement of the old school building which was the company warehouse. But the beetle is determined, so look out for him. If you find any signs of his presence, even in just one cigar, Rick Hacker (in The Ultimate Cigar Book, 2nd Edition) suggests you remove all the cigars from your humidor or the box and search for his body. What you do if you find it is up to you, but get rid of it. He continues "Next put all the apparently healthy cigars in a plastic zip-lock bag, gently force the air out of it, seal it, and place it in the freezer. Leave it there for at least 2 days. 3 is even better. Then, take the bag from the freezer to the refrigerator so that the cigars will thaw out slowly and will not go into shock and split. This is the only time I can recommend putting cigars in the refrigerator. Once the cigars have thawed, remove them from the refrigerator, take them out of the bag and slowly let them return to room temperature. Do not put them in the sunlight to speed up the process or they will split their wrappers. Once again I tell you this from personal experience. In the mean time, completely clean and aerate your humidor. Now you can put your cigars back. The bug is dead. The cigars can be smoked. You have made the world safe. For now." but I can't repeat too often - the primary rule is "keep your cigars cool!" Another thought for this time of the year is the question of what cigars to smoke after the excesses of the holiday season and in the busyness of the return to work. A big cigar would fail to satisfy on both counts - it would very likely be too rich, and may well be too large for the time available to smoke it. You would smoke it too fast which would cause it to burn hot, and possibly make you feel dizzy. What a waste! The sales of the refurbished pipes have been very good. They created, especially the better quality ones, real excitement and anticipated enjoyment from those who bought them. As a result we're running short of stock. Maybe we can benefit each other. Do you have any pipes that you no longer smoke, or know of anybody else who does? It should be a pipe from a leading brand - Dunhill, Charatan, Savinelli, Stanwell, Comoy, Larsen, BBB, Orlik, GBD, quality Freeforms, etc. Especially the sort of pipe that would have been in the Prestige Pipe class. It should have its original mouthpiece and not have been battered. If you have a pipe you'd like to sell that fits the description above, forward me the details (per fax, phone or e-mail). If it seems to be acceptable I'll ask you to send it to me for assessment and then either make you a cash or trade-in offer, or return it to you if I don't feel it is suitable. 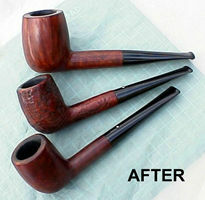 Some of the pipes we were offered had to be down graded or totally rejected because of bowl damage, especially on the rim. This appears to be the accumulated harm caused by careless lighting or handling. Use a pipe rack to store your pipes so that they don't bash against each other, and put a cork knocker in your favourite ashtray to cushion "knocking out". A badly charred rim could often have been avoided by using a proper pipe lighter, one with an angled flame. From February 8, 2003 we will feature the Imco Genie Pipe Lighter at less 25%. This not only has an angled flame, but also sports a foldaway tamper. The flame and tamper can be used in tandem to ensure you can cover the full surface of the tobacco without causing any damage to the bowl. This could add years to the life of your pipe - or Rands to the resale value. What difference can one....year make in the 500 year...history of Cigar smoking? Well if that year was 1763 - the one year during which England occupied Cuba - it turned out to be most significant. Not only did it introduce the Havana taste to Britain and other parts of Europe, it was the start of the long road to respectability for the cigar. This was finally achieved in England in the 19th Century - from 1823 to 1840 the importation of Cuban cigars rose from 15000 per annum to 13 million per annum. Because they were expensive, they were seen as a symbol of success. If you smoked a cigar, you had either made it, or were confident you were on your way - in the right direction. Yes, 1763 was a significant year for Cuban cigars. England influenced many aspects of Cuban cigar manufacture and smoking. The demand was for a rich reddish-brown Colorado wrapper - and this colour became known as "English Market Selection" or EMS - a colour which normally indicates well-matured cigars and is now very popular in the US. The cigar band - contrary to most of the world, the British etiquette was to remove the band. It was "not done" to advertise the brand of cigar you were smoking. When one of the English importers of Cuban cigars, Hunters, was asked to distribute for H.Upmann, they agreed on condition that they distributed only the newly created Montecristo marque. The livery for the brand was based on the idea of "The Count of Montecristo", and was designed by one of the directors of Hunters. This unadorned design of crossed swords on a bright background was innovative in concept for its day. Saint Luis Rey from the BM factory (not to be confused with San Luis Rey) is a small range of full bodied cigars of excellent quality created for the English market more than 50 years ago. Some of the great words in the cigar vocabulary originated in England (think of "Churchill" and "Dunhill") and certain cigar sizes were created especially for the English market. In the 1880's at the request of Leopold Rothschild, a London banker, the Hoyo de Monterrey factory in Cuba started producing a short, thick cigar (4½ inches x ringsize 52). This shape was reproduced under many brands and names, and the shape became known by the generic name of Rothschild (now called Robusto). Some years later the Earl of Lonsdale commissioned the Rafael Gonzalez factory to make a cigar shape exclusively for him - length 6 ½ inches x ringsize 42 (165mm x 16.67mm diameter). This is the same size as the generic Royal Corona and the names are often interchanged. Today the "Lonsdale" is still a very popular size, and the box holding those from Rafael Gonzalez has the portrait of the Earl on the inside of the lid. From February 20 to March 5 we offer a three-pack of Lonsdales at only R245.00. Don't forget - the Lonsdale is not as thick as a Robusto or Churchill - accordingly draw gently for a cooler smoke. Bibliography - we relied mostly on information from Theo Rudman's "Complete Pocket Guide to Cigars", and on Rick Hacker's "The Ultimate Cigar".